A lot of things happened today. Most importantly, Gabriel Medina claimed his first world title. The 20-year-old phenom capped off an incredible year spent proving his worth to a world of doubters. His year started off with a bang, winning on the Gold Coast and following up with impressive results at Margaret River and Bells Beach. His only real stumble came in front of his home crowd, when he finished 13th in Rio. Perhaps his most impressive win was in Tahiti, where he came head-to-head in massive conditions with Kelly Slater and came away victorious. As he moved into the European leg of the tour, Medina hit a few more speed bumps, allowing Mick Fanning and Kelly Slater to catch up a little in the race for the world title. When they met in Hawaii, the finish line was Pipeline – as it should be. After a convincing win over wildcard Dusty Payne in Round 3, Medina pushed Kelly Slater out of the race. When it came time for Mick Fanning to pull on a jersey, the pressure was on – a loss for Fanning meant a world title for Medina. Fellow Brazilian Alejo Muniz put the title in Medina’s hands when he beat the three-time world champ in front of a packed beach. Although Medina had the crown, he wasn’t done surfing. In a final against Julian Wilson, Medina looked to be the early favorite. 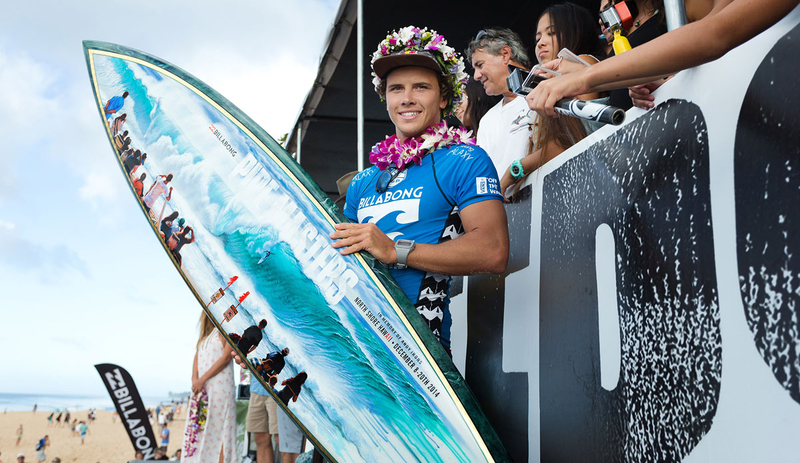 Julian Wilson hadn’t won an event all year, but was in incredible form for Pipeline. The dying minutes of the heat were some of the most exciting of the whole event – Wilson desperately needed a ride in the high 8 point range, and Medina wanted to slam the door on the event.